After all the indulgences of the holidays, many people turn to lighter and healthier dishes. For me it is too hard a transition from rich, spice-filled baked goods to salad for dinner and an apple for dessert. 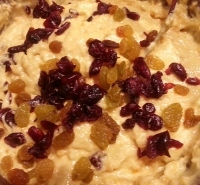 After the decorations were put away and the New Years toasts were over, I kept thinking about making a delicious baked treat that carried over the flavors of the holidays in a healthier package. 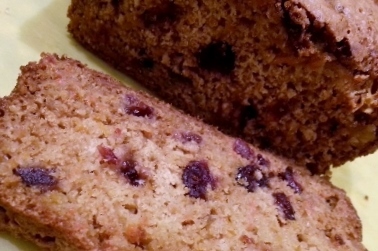 Finding a use for one lonely left-over roasted sweet potato was my inspiration for a dense, moist, low-fat Sweet Potato Fruit Cake that fit the bill. I hope you will get some sweet potatoes at the farmers market soon and roast them for supper and save a few for making a delicious dessert. With a bit of creative thinking, I made a new recipe for low-fat carrot bread, a carrot and daikon salad, and I used the carrots for a “nest” under a roasted chicken. We also ate carrots with homemade white bean dip, carrots in chicken salad, and a few carrots found their way into meatloaf. Suddenly, the worry about what to do with all those carrots was replaced with counting the days until the next market when I can get more! Heat oven to 350 degrees. Mix flours, baking powder, baking soda, and sugar in a large bowl. Stir in egg whites, orange juice and zest and mix until combined. Add carrots and cranberries and stir until blended together. Spray the loaf pan with cooking spray. 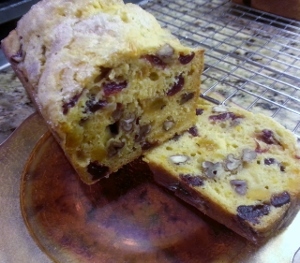 Pour the batter into the loaf pan and bake for about 45 minutes until well browned and cooked in the center. 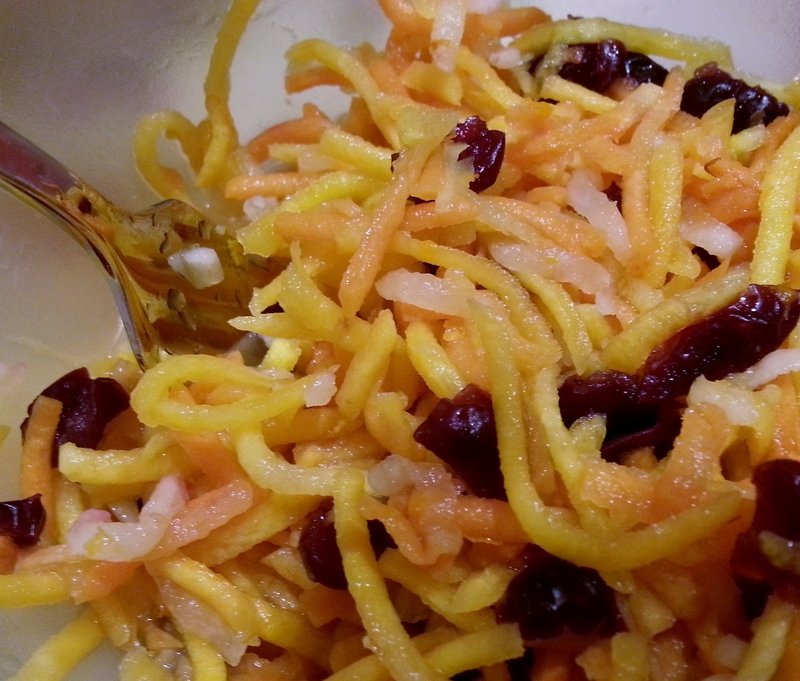 Combine carrots, daikon, and cranberries in a bowl. 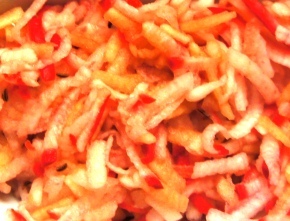 Mix the remaining ingredients and pour over the carrot mixture. 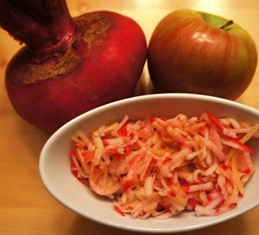 Chill in refrigerator in a covered bowl or jar for at least two hours (overnight is better). This rich creamy soup is the perfect first course and it is a nice pot luck addition as it is vegan (without the suggested topping) , low fat, and gluten-free. I made up the recipe for my One Pot Wonders class which focuses on dishes that take less than an hour to cook and as the name indicates are make using only one pot. 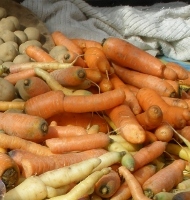 I also try to use local ingredients for the recipes and the root vegetables can be sourced at the Winter farmers markets. 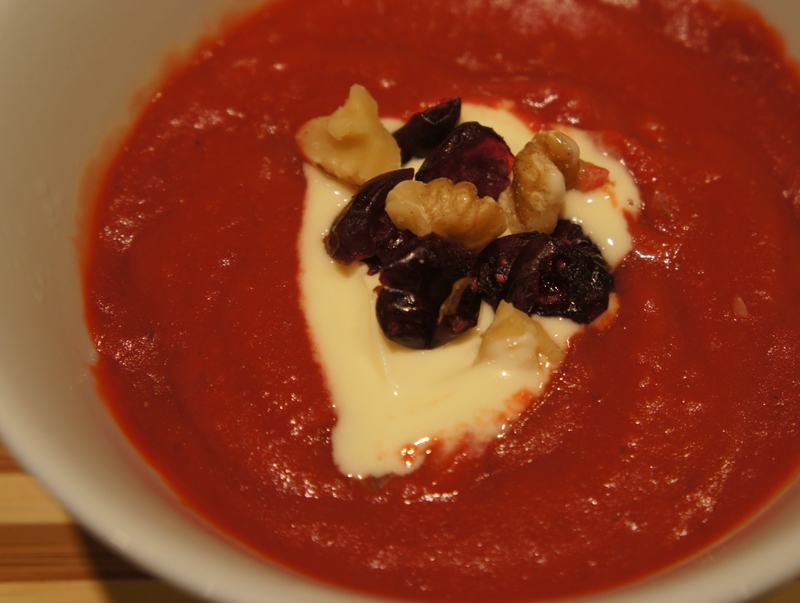 Here is the recipe and serve plain steamy hot in mugs or small bowls and top with Greek yogurt, sour cream, crème fresh, and a sprinkle of walnuts, pistachios, or dried cranberries. 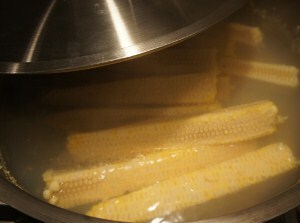 Bring to a boil and then simmer for 30-40 minutes until all vegetables are soft. Two simple ingredients plus a handful of spices are all that are need to make this creamy non-fat,vegan corn and caramelized onion soup. Perfect for a dinner party starter, travels well to pot luck parties, and freezes well for a quick weekday supper paired with a big salad and crusty bread. 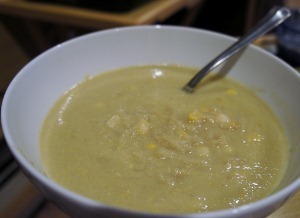 Grab the last of the fresh New England corn and a few onions at the farmers market this week and make this soup! Pour 16 cups of water over the cobs and add salt, pepper, coriander seeds, and bay leaf. cook over medium low heat adding a little water if needed and adjusting the heat so onions cook slowly and do not brown or crisp. Cook for about 30 minutes until onions are very soft, add sugar and cook another 10-15 minutes until onions are soft brown color and very tender. I love this time of year at the Arlington (Massachusetts) farmers market. The corn and peaches are piled high and best of all the beautiful tomatoes have returned. Not those anemic and pale pretend tomatoes they sell all winter at the supermarket, but the crazy quilt of colors and shapes and flavors of heirloom varieties. Here is a simple recipe that celebrates the best tomatoes of the season and other farmers market finds. 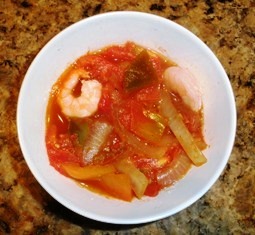 Cook until shrimp is pink and cooked through and vegetables are soft. 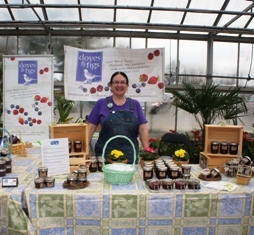 Last weekend was the opening day for the winter market at Mahoney’s Garden Center in Winchester. Our Doves and Figs booth was set between some sweeping potted palms and a large display of citrus trees. I remember vacationing in Florida as a child and driving through orange groves. The heavenly scent of white blossoms and the cheery round orange fruit. It was a great day with lots of people tasting and buying jam and local friends stopping in to shop and say hello. When I got home I could not stop thinking about oranges. I planned several new citrus jam and marmalade recipes and then I bought a big bag of navel oranges and brought my orange obsession to dinner. I roasted some carrots, turnips, and beets that I bought at the market. When the vegetables were tender, I let them cool slightly and then splashed them with a mix of fresh orange juice, a bit of orange zest, some fig jam, white balsamic vinegar, and a dash of black pepper. The main course was orange sesame salmon. I dusted the salmon fillets with flour and paprika. The fish was then seared on both sides in a hot pan lightly coated with olive oil. 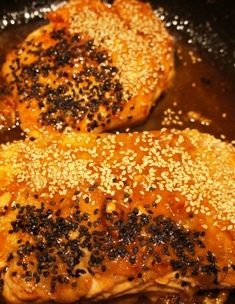 I added a blend of orange juice, rice wine, minced garlic, minced ginger, and a drop of sesame oil to the pan. As the salmon cooked the sauce reduced and thickened almost to a glaze. Just before serving, I sprinkled the fish with toasted white and black sesame seeds. I served the sesame salmon and the roasted root vegetables with a simple green salad, and jasmine rice into which I mixed caramelized onions. It was a sunny supper for a winter night. Rich, warm, creamy flavors are holiday standards. This is the time of year when even Scrooge can’t resist indulging in a cheese filled or bacon-wrapped little something. Layer upon layer of indulgent foods can become tiring unless there is something simple with a bit of bite to break them up. A green salad is a classic option but some beautiful scarlet salad turnips I found at the farmers market made a unique accompaniment to a traditional holiday meal. 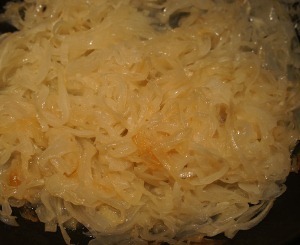 This dish is also great for pot luck parties and buffets as it provides a nice option for raw food and vegan food fans.